Lock in a great price for Lutyens Bungalow – rated 8.7 by recent guests! The breakfast is ok. The location is 10 as it is my office. We liked the place and the friendly staff. The room was pretty and quiet. Nicely heated. Clean comfortable bathroom. Beautiful garden. This is truly a home that I hope to return to often. Even though I know the family will be different travelers each time I visit, somehow all the guests are just as lovely as the host, Mrs Nath. This place is incredible. It’s a little oasis in the big crazy city. There are lush gardens surrounding the house and the swimming pool is fantastic. It’s such a treat to come back after being out all day and take a swim. I recommend staying for dinner as well. The food is delicious and there are usually other wonderful guests to chat with. Shukla, the host and owner along with her husband, is one of the kindest and most welcoming women I’ve ever met. I didn’t want to leave. It felt like home. 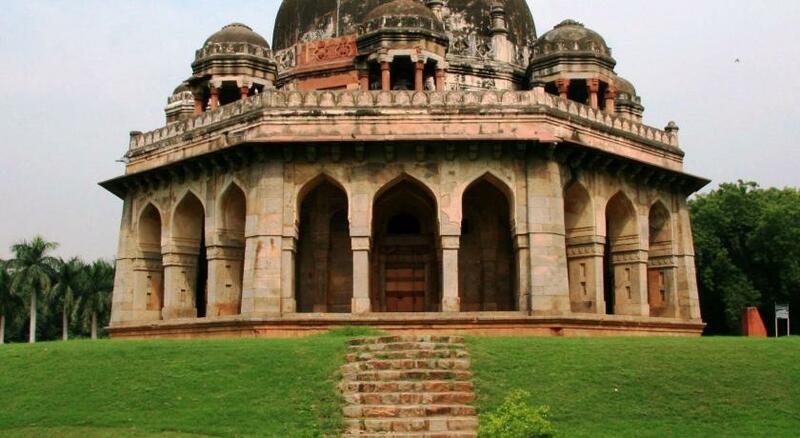 A quiet oasis well located in chaotic Delhi and just a short walk from Lodi Gardens. The family are very hospitable and the home has an interesting history. We enjoyed sitting in the garden, and the swimming pool in the Delhi heat. Close to Khan Market and the embassies, it's a short tuk tuk ride to the sights. It is an amazing experience, the location is perfect, very clean, organized, friendly and absolutely beautiful surroundings. Highly recommended. The people and the accommodations at Lutyens Bungalow are wonderful! I stayed there 5 years ago and liked it so much that I came back this year. The breakfasts are excellent and the optional suppers. Meeting with people from all over the world is great! The rooms are clean and nice and I love the patio area watching the green parrots! This is a real retreat with easy access to places in Delhi. Friendly, personal, caring, homely and a excellent quiet place to relax with the birds, squirrels as they keep you company at the dining table. Very relaxed and calming hotel in the heart of a sometimes confusing and hyperactive city. Lutyens Bungalow This rating is a reflection of how the property compares to the industry standard when it comes to price, facilities and services available. It's based on a self-evaluation by the property. Use this rating to help choose your stay! One of our best sellers in New Delhi! 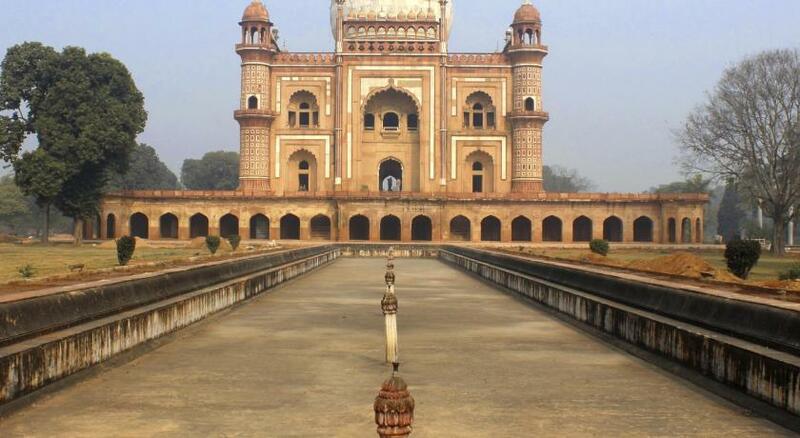 Surrounded by gardens, this heritage property is located 800 feet from Safdarjung Tomb and Lodhi Garden. It features an outdoor swimming pool, a children’s playground and complimentary WiFi access. Lutyens Bungalow is 1.2 mi from the famous India Gate and 3.7 mi from New Delhi Railway Station. Indira Gandhi International Airport is 12 mi away. Fitted with a seating area, rooms are cooled with air conditioning and a fan. They are equipped with a flat-screen TV, wardrobe and an private bathroom with shower facilities. Indian food can be prepared by the in-house cook on request. Guests can head to the 24-hour front desk for assistance with luggage storage, laundry and car rental services. Free parking spaces are available. When would you like to stay at Lutyens Bungalow? Cooled with air conditioning and a fan, the rooms come with a flat screen TV, wardrobe and private bathroom with shower facilities. Heaters are provided in winters. Some rooms are spacious while the others offer garden views. Please note that an extra bed can be accommodated in this room. Fitted with a seating area and offering garden views, rooms are cooled with air conditioning and a fan. They are equipped with a flat-screen TV, wardrobe and an private bathroom with shower facilities. Heaters are provided in winters. Rooms are cooled with air conditioning and a fan. They are equipped with a flat-screen TV, wardrobe and an private bathroom with shower facilities. Heaters are provided in winters. House Rules Lutyens Bungalow takes special requests – add in the next step! Cash Lutyens Bungalow accepts these cards and reserves the right to temporarily hold an amount prior to arrival. Lutyens Bungalow accepts these cards and reserves the right to temporarily hold an amount prior to arrival. Some choice and variation in dinner and lunch options would have been good for a longer stay. But you can always order in takeout if you fancy something different. Beds are rather hard, in the Asian style. Lovely bungalow style rooms. Family feel with shared, tasty vegetarian (and not spicy) dinner (if you wish) and a relaxed garden to chill around. The outside pool, with sun loungers, is a bonus. Feels like a slice of paradise in noisy, chaotic Delhi. The TV didn’t work and they were was no fresh coffee, but they are very small complaints. It was very basic but comfortable. The owner was delightful and very warm. The communal meals were enjoyable and the home cooking was very good. Small room. Lovely location but couldnt walk to shops or restaurants. wonderful location in leafy Delhi. Comfortable room and nice bathroom. Friendly helpful staff. a comfortable old fashioned club. It was a bit noisy experience. You can hear the traffic and your neighbors pretty well. There was a tiny street just next to my room and windows facing a concrete fence across the street. The owner and staff was helpful and friendly. we were welcomed as part of the family and just sat and chatted while marmalade making was going on. Just like being at home with my mother. PERFECT.